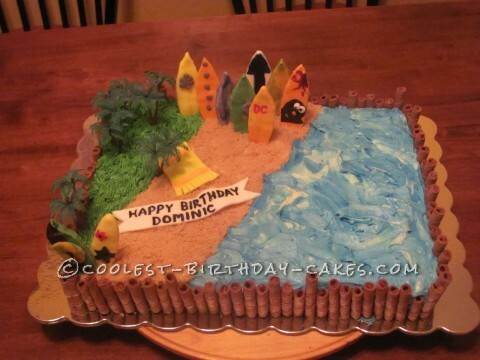 Surf's Up Cake For A Beach Lover! Surf’s Up Cake For A Beach Lover! This is a double layer sheet cake. I crumb coated it then went back with a layer of white frosting. I cut the “cookies” in different lengths to represent a beach fence and glued them to the side of the cake with additional frosting where necessary. I did learn however, that this should be your last step and done just before you eat it. I did it a day before and the cookies got rather stale. I used green frosting for grass with the Wilton Grass Tip. I used ground up graham crackers for the sand, I used blue frosting and white to make the ocean, waved together with a simple spatula. The surf boards, blanket, banner are made from fondant. I allowed my son to help by drawing on some surfboards with a small paint brush dipped into gel coloring. The surf boards were allowed to dry but I put a toothpick in each one so they’d stand up well in the cake.